Fully assembled, ready to use, Durso Standpipe for 1 inch bulkhead.This product uses 1.25 Inch Sched.. Fully assembled, ready to use, Durso Standpipe for 3/4 inch bulkhead.This product uses schedule 26 P.. 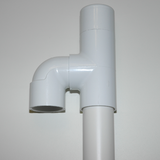 Fully assembled, ready to use, Flexible Durso Standpipe for 1 inch bulkhead.Made from flexible 1.25 ..